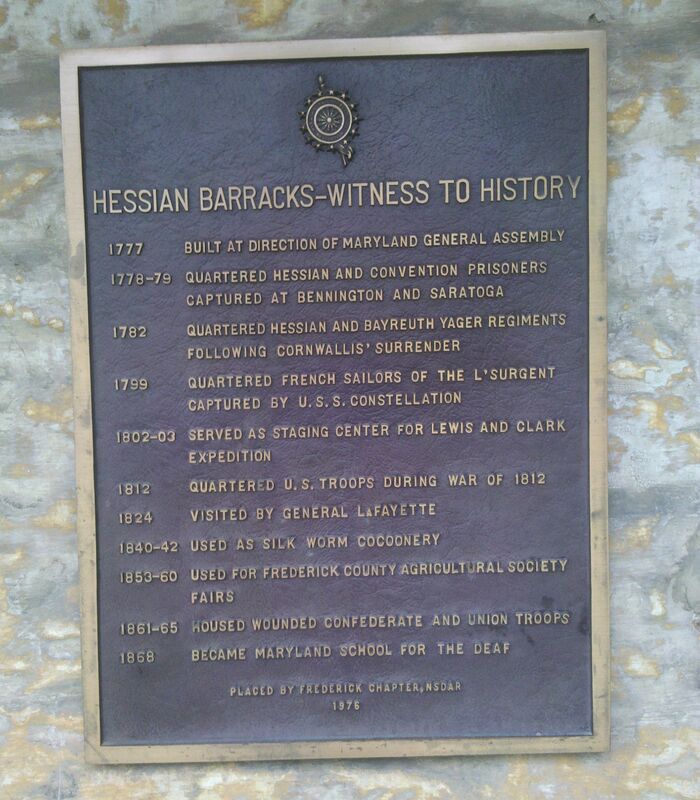 The Hessian barracks in Frederick Maryland dates from the time of the French and Indian war. Although there is some dispute about the actual date of construction, contemporary accounts indicate that the barracks was built to house the soldiers of General Braddock during the French and Indian war as they marched along on their route to Fort Dusquene. The barracks saw limited use during the Revolutionary War as it was in a state of partial completion but in the years leading up to the Civil War, it was used for various functions. The barracks and it grounds were used as an armory and a silk worm production facility as well as a fairgrounds in the years just prior to the Civil War. 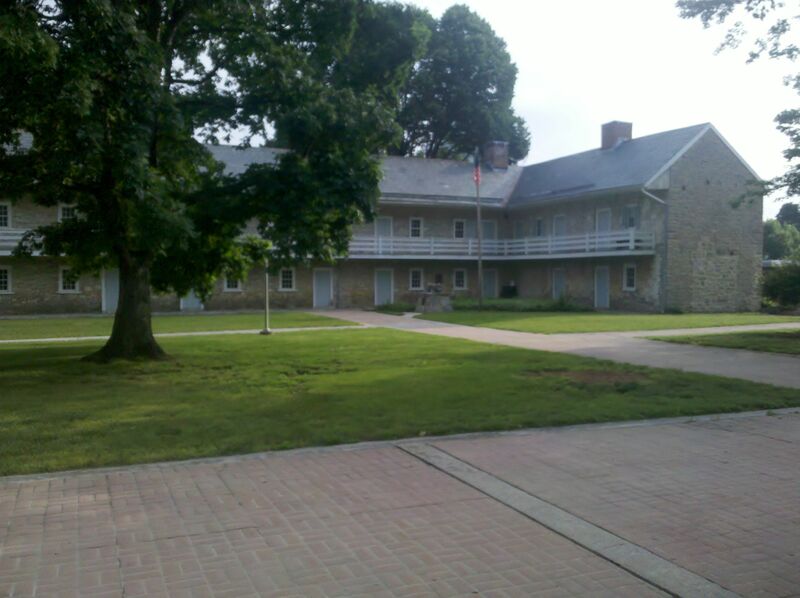 During the Civil War, the barracks famously served as a Union hospital after the battle of Antietam. However, prior to the battle of Antietam the grounds of the Hessian barracks served as a campground for many of the Union regiments marching from Washington in pursuit of Robert E Lee’s Army. On September 12, 1862, Oliver Cromwell Case and the soldiers of the 8th Connecticut Volunteer Infantry Regiment marched into Frederick and made their camp on the grounds of the Hessian barracks. At this time, the barracks was in use as a hospital for both Union and Confederate soldiers. The soldiers of the 8th Connecticut along with the rest of the Army of the Potomac sojourning in the city of Frederick received a warm welcome from the citizens who were glad to be relieved of the occupation by Confederate forces. Women blessed God and the soldiers, and rushed out to kiss the old flag ; gray-haired men hobbled forth with radiant faces ; and the young shouted their welcome ; while children capered in holiday glee. Where such demonstrations of joy were made at our coming as I never witnessed. Women came rushing up to us screaming and clapping hands and acting as if crazy. One woman seemed determined to throw her arms around my neck and several of officers were kissed by fair ones. The yard and hospital were full of sick rebels 600 of them and 150 of ours left when city was evacuated. The Surgeon came up to our colors and kissed them tears of joy dropping from his eyes. We halted and regit bivouacked in hospital yard for night. I took a walk down through city with Capt. Smith to try and get something eat but at all hotels they were eat out and seemed to be every where by rebels. CPT Marsh also recounts being invited into a Frederick home for supper along with CPT Smith of Company E.
I took a walk down through city with Capt. Smith to try and get something eat but at all hotels they were eat out and seemed to be every where by rebels. We inquired at one hotel where got same answer as before “nothing to eat” a gentleman standing by beckoned us to follow him. We did. So when were taken to a fine residence a few streets distance and told to walk in where found table set. Were taken up stairs to wash room where got off some dirt, Then took seats to table and had an excellent supper. Very fine people. 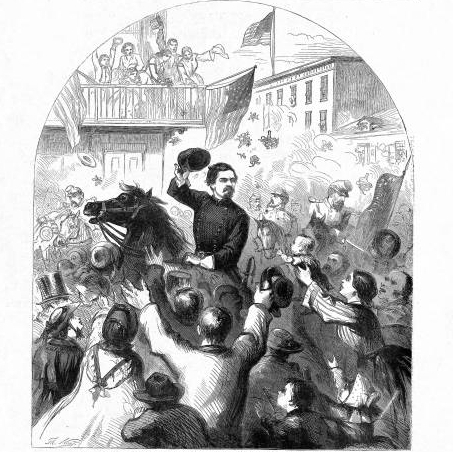 As Oliver and his fellow Connecticut soldiers enjoyed the hospitality of Frederick, General George McClellan made his entrance to the city in fine style. The citizens of Frederick welcomed Little Mac as a liberating hero with citizens turning out to wave flags and present the general with flowers. Many men and women wept openly with joy at his arrival in this pro-Union Maryland town. Oliver and his comrades likely witnessed the grand scene of McClellan’s arrival in Frederick.